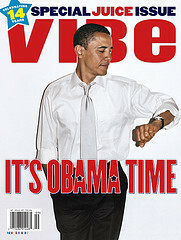 Just My Thoughts People: Sure He's Cool, But Why Will You Vote For Him? 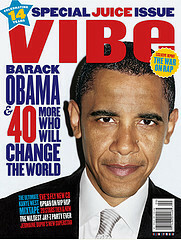 I think it's cool that Vibe decided to run a cover story on presidential candidate Barack Obama and I might even have to pick this issue up just to see what they'll print about him. But I also wonder how many people will vote for him just because he's black? I know plenty of people who base their votes on who is popular or who their friends/family are voting for which is just wrong on so many levels. I predict that unlike the campaign that Diddy ran last time, the younger generation really is up on their politics now and they will make a solid vote based on who they feel is truly the lesser of two evils and who is fighting for what they believe in (but of course I could be completely naive and overly optimistic). For those of you who don't really know what his issues and views are, all you have to do is go to his website which will give you an overview but also listen to his speeches as well. It's very important to see candidates in action. I'm not big on speaking about politics - I vote for who I vote for and I just leave it at that and besides that, 98% of them are bogus anyway. But since this is going to be one of the biggest races ever, I felt the need to briefly speak on it. So here is some helpful info that you can link to on the candidate. But remember, this is just a starting point.